Hi friends! It's almost the New Year, time to think about the year past and make a whole bunch of resolutions I'm not going to keep. Or, maybe this year will be different. I've bought my copy of the 2012 Workbook and Planner from the Goddess Guidebook site, I've started filling it out, and I'm planning on using it to help me plan out my projects and goals for the year. Looking back at the 2011 sewing scene, what trends stand out in your mind? The Kona and Habitat challenges within the various Modern Quilt Guild branches, rainbows and bright colors. Projects including both hand and machine quilting. What were some of your favorite things related to sewing this past year? Getting a little more creative with my free motion quilting. What did you make that you’re most proud of? I finished up my first PDF quilt pattern; it's called Ruffle Crush. Writing and making the pattern took forever and I'm glad I finally got it done. I have a couple more ideas for patterns that I'd like to get written up soon. What sewn projects have you seen this year that you absolutely love? This pair of quilts by Amy and gooma8x, seen on flickr. They collaborated to make this intricate and beautiful pair of quilts; I love the colors and the detail and someday I would love to be part of a similar project. Do you have a favorite sewing book or pattern from the past year to recommend?I got Material Obsession II this year and I think it's a great book, really one of the more creative newer quilting books in my opinion. I also got a copy of Natural Patchwork by Suzuko Koseki, and love the simple cute projects included in that book. Are there any trends you’re over and done with? Don't hate me, yellow and gray. It's just not my thing. What are your thoughts about social media? How is it going for you? What do you love or hate? I still love reading blogs and I enjoy the feeling I get of actually glimpsing part of the author's life. I like pinterest for the eye candy, but it gets too overwhelming for me very quickly. I guess I like the stories behind projects and pinterest doesn't provide that. Did you have a favorite fabric collection or print in 2011? Not really. I have a good rainbow of stash fabrics that I enjoy sewing from. I still really like Tula Pink's Neptune, and I only ever had a honey bun from that line (remember those?) --maybe that one should be reprinted some day. What do you predict for 2012 in the sewing industry? Popular fabric colors are changing to more muted colors, people are trending towards using offwhite, cream, or tan backgrounds instead of stark white. Orange and blue/aqua will continue to be a popular combination in quilting. Someone else said more quilters will branch out into sewing clothing; I think that's probably true. I still wish we could get some more clear blue blues and green greens (as opposed to lime green and baby blue or aqua) in newer fabric collections. Like the blues and greens from the Katie Jump Rope collection. Can you tell us what to expect from you in 2012? Any big projects or life-changing goals? Sewing wise, my goals are to continue to whittle down the UFO list, to make Dan's new quilt and Laura's baby quilt and finish J's quilt and my king size quilt (machine quilting it myself! ), continue submitting project ideas to magazines, and finish more PDF patterns to sell on my own. 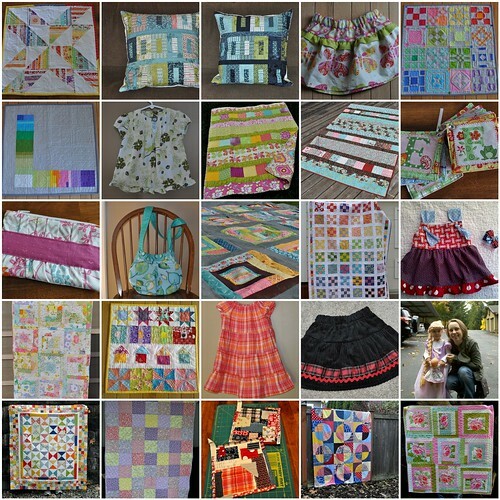 Also to make and donate at least 3 quilts to charity. 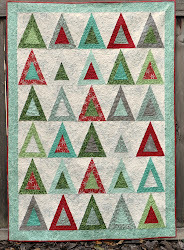 As far as blogging, I'm hosting Focus on Free Motion Quilting next month (starting on January 3!) and would like to do a series here on the blog on how to sew clothing from patterns later in the year. The Ruffle Crush pattern is beautiful! I agree about the Ruffle Crush quilt, very beautiful. Never though about incorporating ruffles. I love reading your thoughts on 2011 and predictions for 2012. I also feel privileged that I got to see the Ruffle Crush quilt live and in person this year. And to meet you IRL too! Have a great new year! Coming to Utah in 2012? 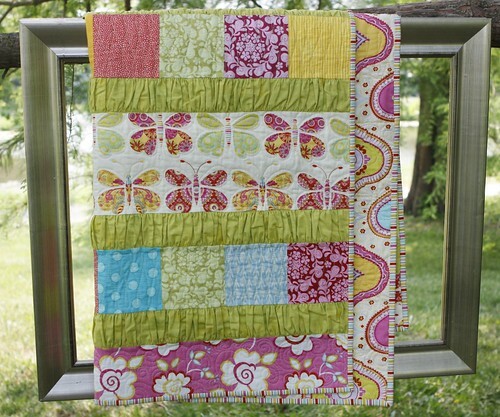 your ruffle crush quilt turned out so pretty ! Circle Quilt Top, and Giveaway Winner!